Contemporary poetry on World War I is not at all a paradox. We have already suggested – and we will keep on offering – poems by contemporary authors dealing with the cultural and human legacy of the Great War: they prove that we can – and we should – be still personally involved in the living remembrance of this common past. However the new work by the multiple-prize-winning French poet, writer and translator Jacques Darras succeed in bringing us perhaps a step further than a “simple” living remembrance. With its long poem entitled Je sors enfin du Bois de la Gruerie (Editions Arfuyen, 2014) he offers a “prismatic” composition, which discloses to the reader different accesses to the Great War and he relates this multiplicity to a beating heart at its centre. It is not easy to do justice to this work in a short review, but we’d like to discuss at least some central features of Darras’ long poem in order to stress its importance in indicating a new and fruitful attitude toward the Great War. We may start with some formal and stylistic remarks. The work covers 208 pages and it is organized in 15 chapters. Lyrical compositions, prose texts, short manifestos and (sometimes long) quotations are combined in an amazing structure, in which the rhythm has a central place. A continuous change of register within the work (from the ironical to the polemical, from the narrative to the assertive one) creates a polyphony of attitudes and perspectives, so that the readers cannot be passive, but are forced to enter in a creative relation. Moreover Darras’ mastery in exploiting his "outil-poème" comes to light in the incredible wordplays, neologisms, assonances. One should read aloud to enjoy fully the “Dada aesthetic” of this poem. 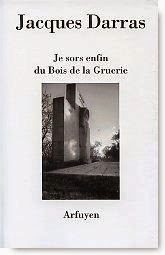 Je sors enfin du Bois de la Gruerie arises from a biographical event in Darras’ family history. His grandfather died in September 1914 in Bois de la Gruerie, on the western side of the forest of Argonne, in the territories of the Department de la Marne. This wood was the setting of cruel fights from September 1914 up to the autumn 1918 and a large number of remnants are still visible today. Here, few months after the beginning of the conflict Édouard Darras was hit by a grenade. 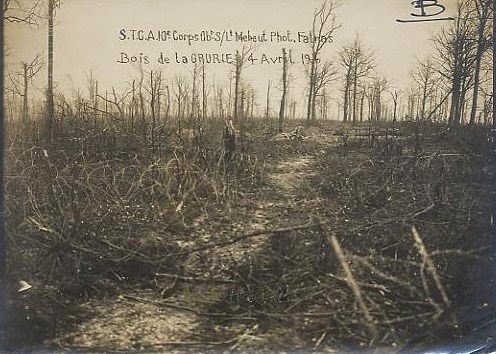 Only after about a century his grandson returns to these places, walks among the trees and on the today hidden trenches and deals with his domestic memories. Jacques Darras cannot avoid to recognise the deep impact that this event had on his father’s life and, as a consequence, on his own life. He draws so a red line across the decades, across the places and occurrences that tie together his family history. And yet he does not restrict his reasoning and his feelings to this first biographical stage; he uses instead them as a magnifying glass to embrace the collective experience of the Great War: millions of men were killed, millions of women were left alone, and their families, relatives lived their absence. A mass carnage - the personal family fate is part of it. The whole is accessible primarily by its part, by this intimate experience and remembrance. The part, the biographical element gets its true weight and size only within the whole. Especially in chapter 13th this sense of sharing mournfulness, compassion (in its etymological meaning), real pietas comes to light. But also in chapter 7th – at the centre of the book, as a pivot of this magnificent poetical mechanism – we find crucial passages: Darras first describes – or imagines, but is it so different? – the death of his grandfather, 27 years old, as he was pulverized by the grenade; he then spies out the emptiness left in his life but he finally confesses he cannot tell the death of his grandfather apart from that of the other soldiers: he bears now with him ten thousand dead men in addition to his grandfather, he leaves from the Bois de Gruerie with all the anonymous soldiers who passed away there. And yet Darras’ work avoids all celebratory and heroic attitudes and shows a great justice and composure in dealing with the Great War: an attitude of moderation and tact-, that we should wish to see more and more predominant during the Centenary. The book can be seen as a report of (and a guide for, since the reader is invited to travel over it again) a journey from oblivion to memory. This is also the meaning of the title: getting out from the Bois de la Gruerie corresponds to break the silence and the forgetfulness of this personal/collective tragedy and enter the living world, to regain full awareness not only of the past events, but also of their effects on the present and even their lesson for the future. Also from this point of view a personal recollecting the family memories is entangled in the collective tale. A wide collection of voices and records of famous French, English and German authors represents the chorale, which supports Darras’ effort to frame anew and in a clearer way the series of cultural, political and historical events, which lead to the Great War. And being a poet, Darras summons poets and writers of that time up: the Dada poets (much more than the surrealists) and then again Apollinaire, Barbusse, Breton, Céline, Cendrars, and Pierre-Jean Jouve (who actually deserves much more attention than what he usually draws); but also the German voices of Hugo Ball and Erich Maria Remarque, even of Ernst Jünger. And then the author celebrates especially the English War poets: Wilfried Owen, Siegfried Sassoon and Edward Thomas. Great honour is paid however to a “trio d’intelligence majeure”: Romain Rolland, Stefan Zweig and Sigmund Freud. They raised their voices above the collective madness, they praised the peace and unmasked the subtle mystifications of the “uniformity of the uniforms”, which covered a foreseeable massacre under the ideals of Homeland, Duty even Beauty. 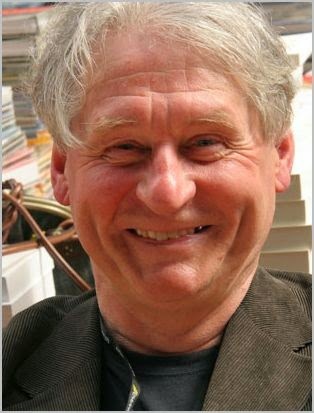 It is especially in opposition to the propaganda and the homogenization (and so devastation) of the culture at the beginning of the First World War that the pacifism of authors like Rolland becomes an admonishment and a spur for us, the readers, too. It is about to preserve true critical sense not only towards the opposite pole war/peace, but also and above all toward the rhetorical attitudes and standardised ideas, no matter if in relation to the legacy of the Great War or in relation to the contemporary social and political conflicts in our world, starting from Europe. Here again Darras offers us a great lesson with this book, driving us to deal with our history, to face its problems and to take a position, which always means to act in our life accordingly. Je sors enfin du Bois de la Gruerie is therefore not only an honest tribute to the Great War as both personal and collective history, but also a sort of manifesto for the present and for the future. In this sense we can only wish that this work will reach as many readers as possible, so to really imprint the Centenary.